The Maiden Tower is a 12th century monument in the Old City, Baku, Azerbaijan. The Shirvanshahs' Palace, dated to the 15th century, it forms an ansemble of historic monuments inscribed in 2001 under the UNESCO World Heritage List of Historical Monuments as cultural property, Category III. It is one of Azerbaijan's most distinctive national emblems, and is thus featured on Azeri currency notes and official letterheads. 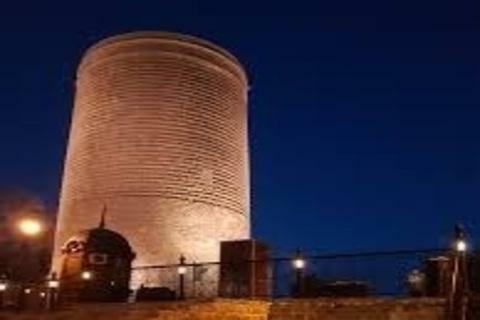 The Maiden Tower houses a museum, which presents the story of historic evolution of the Baku city. It also has a gift shop. The view from the roof takes in the alleys and minarets of the Old City, the Baku Boulevard, the De Gaulle house and a wide vista of the Baku Bay. In recent years, the brazier on the top has been lit during the nights of the Novruz festival. Baku's Maiden Tower is a legendary place and world famous landmark in Baku, Republic of Azerbaijan. The Tower is covered by cloud of mysteries and legends which are rooted to the History of Azerbaijan and national Culture of Azerbaijan. The pool of tower's epics and legends is a part of Azerbaijan's culture and national heritage. Indeed, Some epics became a subject for scenario for ballets and theatre's plays. The Maiden Tower (ballet) is a world class Azerbaijani ballet created by Afrasiyab Badalbeyli in 1940 and ballet's remake was performed in 1999. Consequent to the receding of the sea shore line of the Caspian Sea, a strip of land emerged. This land was developed between the 9th and 15th centuries, when the walls of the old city, the palace including the huge bastion of the Maiden Tower were built.